When you’re buying an used furniture piece you should be able to renovate it a little bit. If your skills are good enough you can even make it even more beautiful than it was originally. 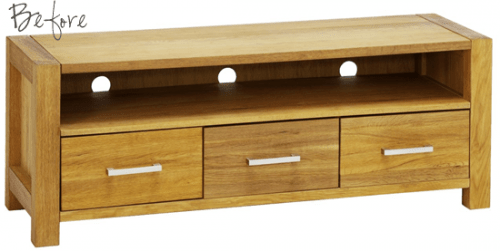 This TV bench was originally in oak, so the color was kind of yellowish. After two coats of driftwood stain so it became a bit grayer. Its top was painted in light gray and some sanding was done to it afterwards to allo the wood shine through the paint. The knobs were replaced and the TV bench become a real beauty.